The isolated heart system is a versatile solution for pharmacological researchers investigating mice, rats, guinea-pigs or rabbits hearts, in health and disease, or following drug challenges. cardiac electrophysiological and mechanical parameters. Inotropic and chronotropic response in the isolated heart can be easily investigated. A special care has been taken to insure low dead volumes and good temperature regulation (this is a key point, especially for study on Murine heart). 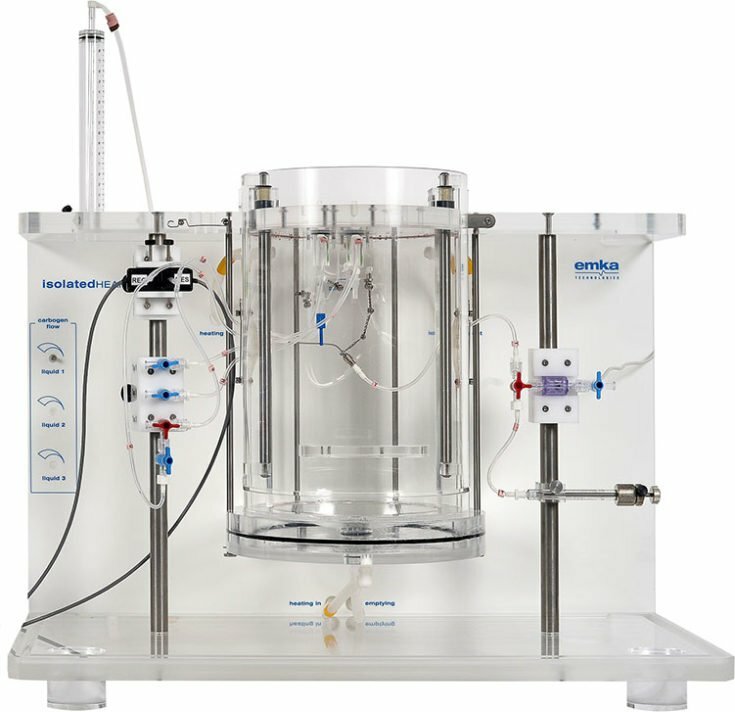 Fully integrated, this apparatus offers 3 perfusion modes and the ability to perfuse up to 3 physiological liquids. Along with IOX2 software, it permits the acquisition of cardiac parameters through flow probes, pressure catheters or ECG electrodes. 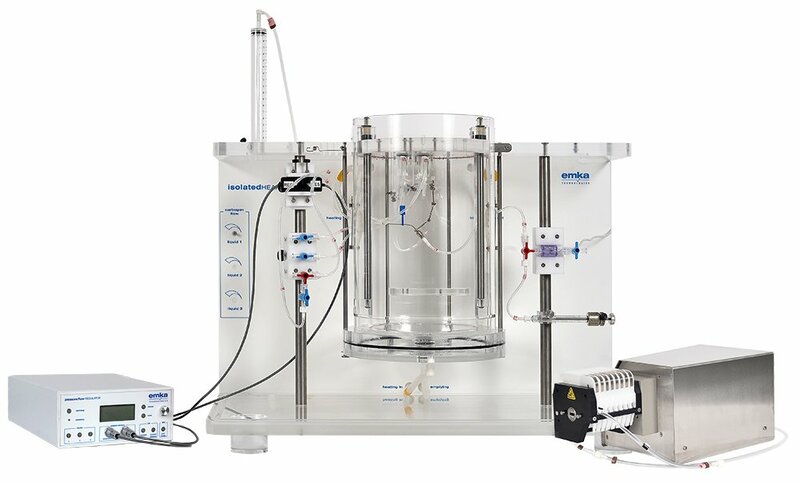 Fully integrated, with all tubing clearly organized, yet easily accessible, this apparatus has a spacious heart chamber, equipped with heated walls and floor and a wide opening through sliding door. The temperature is kept constant at 37°C, while oxygen and nutrients are provided by perfusing the heart. 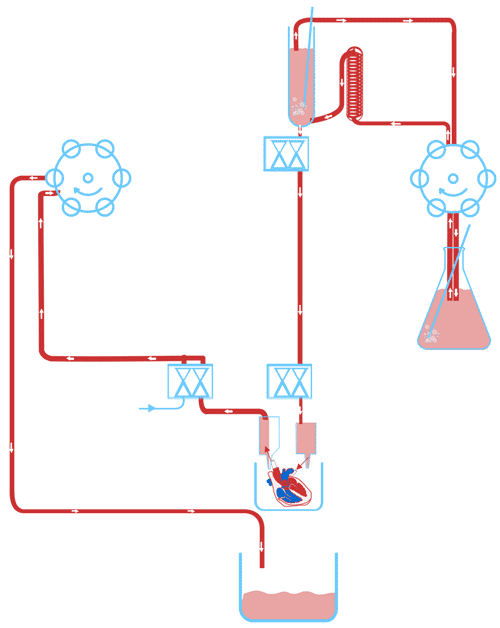 In the Langendorff heart perfusion mode, the perfusate is pumped through the aorta towards the heart. It does not enter the left ventricle, but is diverted into the coronary arteries. This mode permits the study of heart contraction, heart rate and vascular effects. It is ideal for the study of intraventricular pressure, cardiac contractility and relaxation, ECG and coronary flow. 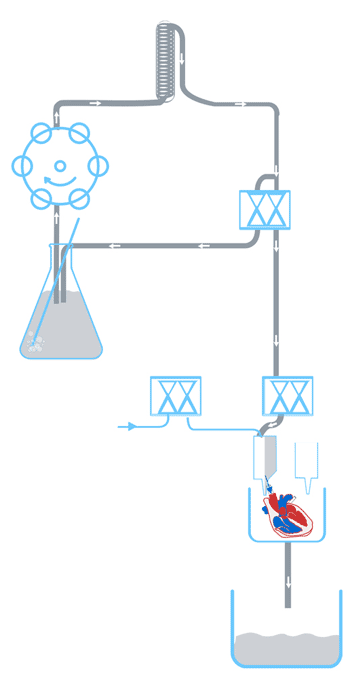 In the working heart perfusion mode, the flow of perfusate mimics the flow of blood in situ. The perfusate enters the left atrium via the pulmonary vein, is pumped into the left ventricle, from where it is pumped into the aorta, against a resistance that mimics the global resistance of the body. As the name implies, this technique allows the heart to perform its physiological pumping action, i.e. it performs pressure/volume work. Therefore it provides a complete analysis of heart function and can be used for the study of cardiac metabolism, long-term pathology or ischemia-reperfusion. Cardiomyopathy, Cardiac metabolism, Valvular heart disease, Ischemia-reperfusion, Pulmonary hypertension and more!